Have you ever spent the night in the pyramid? Have you ever consider to asociate the pyramid with luxury of SPA? Now you have a unique occasion to spend 2 overnights in extraordinary 5* hotel The Pyramid. Owing to its construction the building concentrates energy beneficial for the human body. But not only that - in the hotel there is a SPA & Wellness Center with swimming pool, jacuzzi, sauna and many more. But that is still not all! In Tyskie Browary Książęce (Tyskie Brewery) you will have a unique chance to see all stages of production of beer, to visit a brewing museum and to taste this golden beverage. Some people believe that God first created beer and than separated water from it. Taste one of the best beers and combine it with relax in luxurious 5* hotel. Welcome to the Beer World! During the 2.5 hour walk through the spacious premises of our Brewery the guide will lead you along a very interesting route. You can see carefully renovated buildings dating back from the 19th century and huge fermentation tanks. You can also see state-of-the-art packaging lines working at an impressive speed of 60 thousand bottles per hour and picturesque garden next to the Director`s Villa. You can touch an original copper ladle dating from 1916 in an antique brewhouse and feel the chill of the brewery`s cellars. We guarantee that you visit the Brewery during its "full operation" which lets you see how we brew beer. One of the biggest attractions is a drama documentary made in 3D technology to be seen in a special Museum`s cinema. The film relates to Tyskie Browary Książęce's history which goes back to the end of 16th century, the Pszczyna Land and its ruling princely family. You will be accompanied not only by professional tour guide but also by virtual ones: numerous multimedia kiosks providing many interesting information. 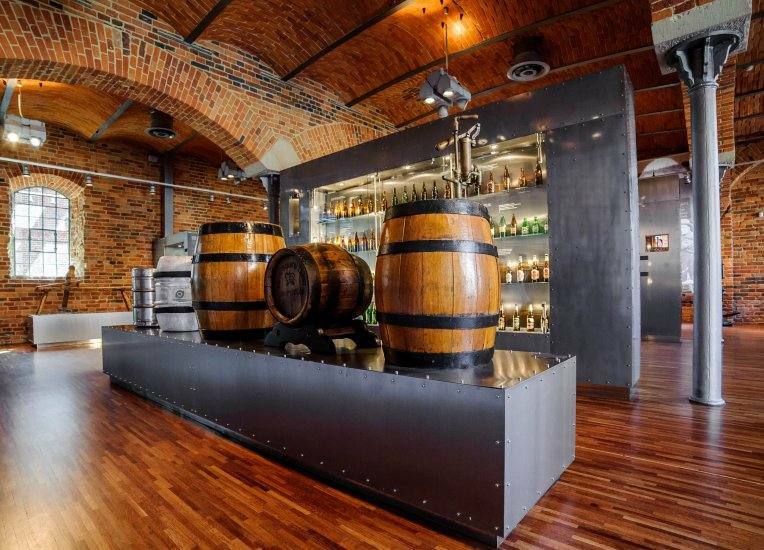 COOL SURPRISE - At the end of the visit we will welcome you to visit the pub in the Museum`s cellars, where surrounded with Neo-Gothic arches and original brickwork, you will be served with a glass of quality beer straight from the Brewery. Furthermore you will be presented a special certificate signed by the Chief Brewers, which declares you a member of the brewery"s circle of friends. On the premises of the Museum you can also visit a souvenir shop, where you will certainly find a nice reminder of your visit!